Torsion Springs | Hyde Spring & Wire Co.
All of our torsion springs are custom-made to fit your needs! For new designs and changes to existing designs we suggest you call and talk to one of our design specialists. 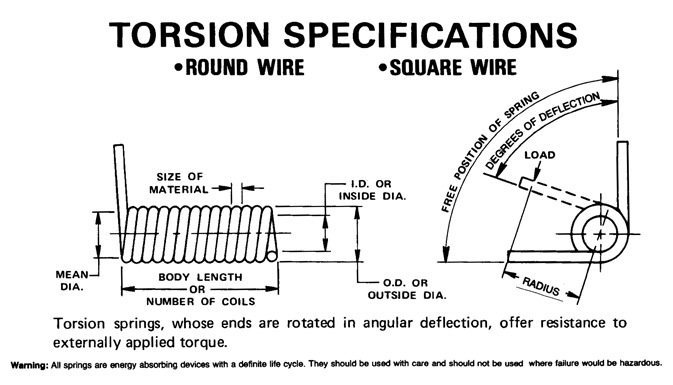 There are many questions that need to be answered to supply you with a torsion spring that works and is cost effective. Our design specialists are trained to help you answer these questions. Occasionally, we have customers that don’t have the correct measuring tools or knowledge to fill out these forms, but they have a need for springs. Please feel free to call and speak with one of our highly-trained and experienced artisans. They are gifted in knowing just the right questions to ask pertaining to your situation. Or, if you have a sample spring, please feel free to send it in and we will get back to you with a quote as soon as possible!